Sue, I know a little about those poor men from my own research. I agree that it's a shame there are no longer programs and incentives offered to our prisoners to encourage them to come back to society and better themselves, taught to make better decisions, or helped off their addictions. Instead, as a society, we are content to lock them away and forget about them. We don't want to pay the extra money for those "perks" whereas we're perfectly content in paying the CEOs of these few corporations who own private prisons very high salaries and bonuses each year. With reorganization of taxpayer money, we wouldn't see a raise in taxes, but we'd definitely see a reduction in fights, lower recidivism and guards who are safe at work. Thank you, Tonya, for this sobering look at the numbers. 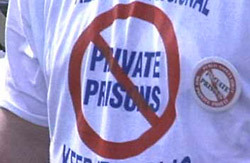 I've been uneasy about the trend toward prison privatization, and I'm not happy to see that my fears are confirmed. I was watching a documentary about the Central Park Five (http://www.imdb.com/title/tt2380247/) , young men who had spent years in prison after being convicted with coerced confessions. One of them had a poignant moment when he recalled his early years, "In those days, you could go to school," he said, so he'd finished high school and even gotten a two-year degree. By the time he was exonerated, "perks" like education were history.